When the Buddha announced his impending exit from the sphere of mortality, his dear disciple Ananda burst into tears. "Lord, you have been the polestar of our spiritual path so far. Whom should we contact for guidance and higher instructions when you will not be there in the land of the living?" he asked. The Buddha replied: "Atmadeepo bhava" — Be light unto yourself. Your wavering, questioning self must be silenced at the still point of concentrated consciousness. Amidst the darkness of worldly delusion only the emanation of radiance from within — like the full moon — can bring enlightenment. 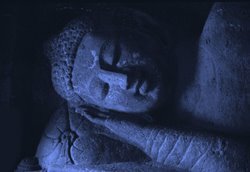 Guru Purnima symbolises emanation of inner illumination, the awakening of the sleeping Buddha within. In the Bhagavad Gita, Krishna advised his dear disciple Arjuna: "Lift yourself up with the help of your self". You are your best friend, philosopher and guide, at the same time you can be your worst enemy as well. Arjuna was never advised to seek refuge in a guru. Rather, he was advised to rise above all religious rituals and seek refuge in Him, the embodiment of eternal Being, the pure Consciousness, and real Self behind the apparent ripples of delusion. The concept of seeking the light within is perfectly in tune with scientific spirituality. Whenever we sincerely seek intuitive guidance from within we create a magnetic pool to attract the requisite energy vibrations of infinite potentiality hidden within us. Each soul is potentially divine and we need to awaken this divinity through concentrated efforts and continuous aspiration. This is spirituality. No one else can make us gain the same; we need to source it from inside. In the Mahabharata, when Dronacharya refused to accept Eklavya as his disciple, the boy made an image of Dronacharya and started practising archery in front of the image. The secret lies in intense aspiration leading to requisite release of the potential hidden within through the psycho-logy of faith in a guru despite the physical absence of the guru in the learning process. Aurobindo had an experience in cosmic consciousness due to his intense aspiration and soul searching. He never had a guru. Although he received instructions on yoga from Bhaskar Lele, he never accepted him as his guru and his teachings did not lead him to self-realisation. A true guru can be instrumental in transformation of our ego into divine self and release of divine consciousness through the mechanism of faith. But the dogmatic claim of the essentiality of a guru in the spiritual path falls apart on closer scrutiny. The life of the Buddha, Christ, Ramakrishna, Auro-bindo, Ramana Maharshi and others bear ample testimony to the fact. Guru Purnima, therefore, is an occasion for awakening of our inner illumination in full beam for manifestation of the divinity already within us.